Why do we need open data access? You have probably heard of the term “open data” by now. If you have not, it is definitely time to listen up. Open data is not a new concept, although it only seems to have gained traction recently. It is simply defined as data that anyone can access, use and share. We live in a globalized world where sharing potential is at its peak, yet everyone is so concerned about locking up their data. Of course, if the data is sensitive, there is a reason to keep it private. But for the sake of progress, should we not be sharing our data whenever possible? Below, we will discuss some of the main reasons that open data access is necessary and how you can go about ensuring this for your data. One considerable motivation for having open data access is the fact that it accelerates the rate of discovery. By having access to data more easily, scientists have more resources to fuel their work. The more data you have access to, the easier it is to identify trends and the more evidence there can be to support claims. Open data also enables collaboration. We know that two heads are better than one and being open with your collaborators really speeds up the research process. You can reduce the risk of data degradation by opening up data access. This is simply because if more people have access to the data, there are likely to be more copies of it. In turn, this means that if one copy is compromised, then there are still others available. The data can also be said to be kept alive to an extent; if people are still working and researching with it, then it remains relevant. Transparency is the key to data integrity and good science practices. By sharing data, you enable replicability and reproducibility. It also expands opportunity for proper peer reviews to be performed and for suggestions as to how the work can be improved. It is also important for supporting any work you might publish, so others can understand how you came to your conclusions. An argument for open data access is one to do with how the research behind the data is funded. If research is publicly funded, there is merit to saying that the resulting data is owed to the public. By making this research public, making it open access, the people funding it receives something in return. More interestingly, individuals and academic teams are much more easily able to make use of scientific insights, again fostering progress. 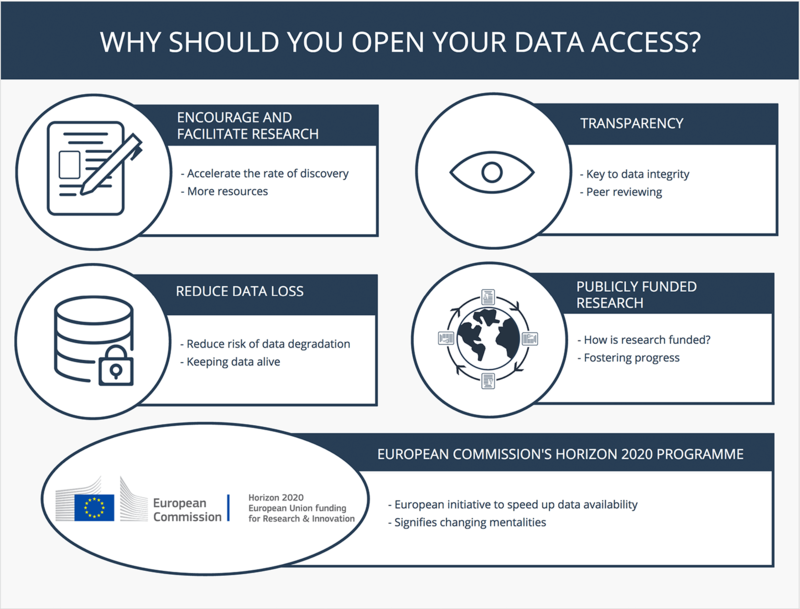 An important driver of open access data is the EC’s Horizon 2020 program. This is an EU initiative to speed up the rate at which data is being made available to everyone. It indicates a clear change in mentalities, as well as recognition that research and the way the scientific community operates is evolving. For some researchers, it will be required by funders to have open data. This would apply to you if your research was being funded by FP7, Horizon 2020, ERC, FET, FCT or NWO. If you are working in any form of organization, and there are other scientists and data involved, there should be a policy in place for all to comply to. This policy should be regarding the open access of data that anyone produces at the organization. The basic things to be included in this would be a definition of and motivation for open data, principles to guide the release and reuse of open data, an outline of the types of data to be made open and management standards for those datasets. Something that relates to having a common policy is having a common place to store and be able to access all of the data from. You must define where and how data should be stored so that everyone follows the same practice. It is advisable to have a singular repository for everyone in the organization. Doing so not only makes it easier for people within the organization to access data, but you are also then able to direct anyone else who made need access to one single place. If your current data sets are totally closed and private, but you wish to move to open data, do not rush the process. You will want to make sure that any data you are going to open up is ready for it. This means ensuring the data is complete, machine-readable and will be permanently available at no cost. You must also make sure that no one’s work is jeopardized by making the data open. It is then advisable to go through one dataset at a time to make sure it is actually useful when made open. The easiest way to open up data is to keep it digital, right? Everything around us is digital these days so why not use this to our advantage? There are three primary tools we see as keys to open data access. Of course, you need an electronic lab notebook, but let’s first look into the platforms of Figshare and ScienceOpen. Figshare is an online data repository where you can easily export your lab notebook to. Here you will be able to preserve and share your data in the form of figures, datasets, images and videos. It is totally free to use and is of course integrated with your ELN, labfolder. ScienceOpen is a networking platform that connects scientists globally. It enables post-publication peer review, recommendation, social sharing. All of this brings researchers closer to the data and content. It totally accessible to all scientists, truly embodying the concept of open data access. Labfolder further aids your efforts towards to open data in a number of ways. 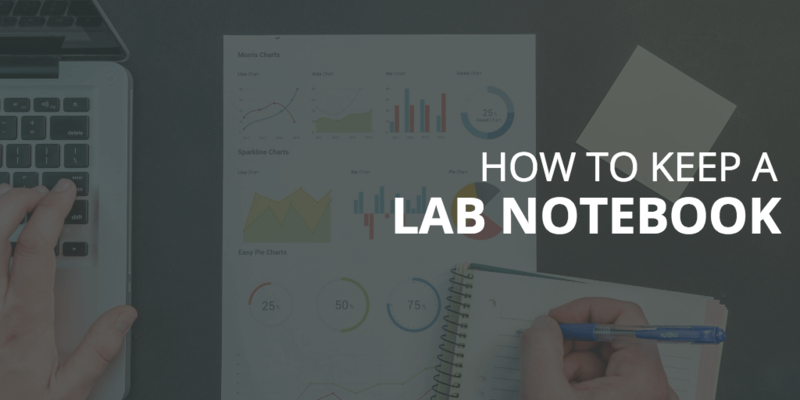 Firstly, it ensures data is machine-readable since the data is digital as soon as it is entered into your lab notebook. It allows for easy template and protocol creation, facilitating policy adherence. Your entries in labfolder also have headers. You can fill these out with all the relevant information about the data, to give context to others viewing it. Finally, it acts as the central storage place for all the data of you and your team.